This sample shows the Wireless network topology. Wireless network topology is a logical topology. It shows how the computers connect and interact each other when there is no physical connection, no cables connecting the computers. The computers communicate each other directly, using the wireless devices. Wireless networks can have infrastructure or ad hoc topology. 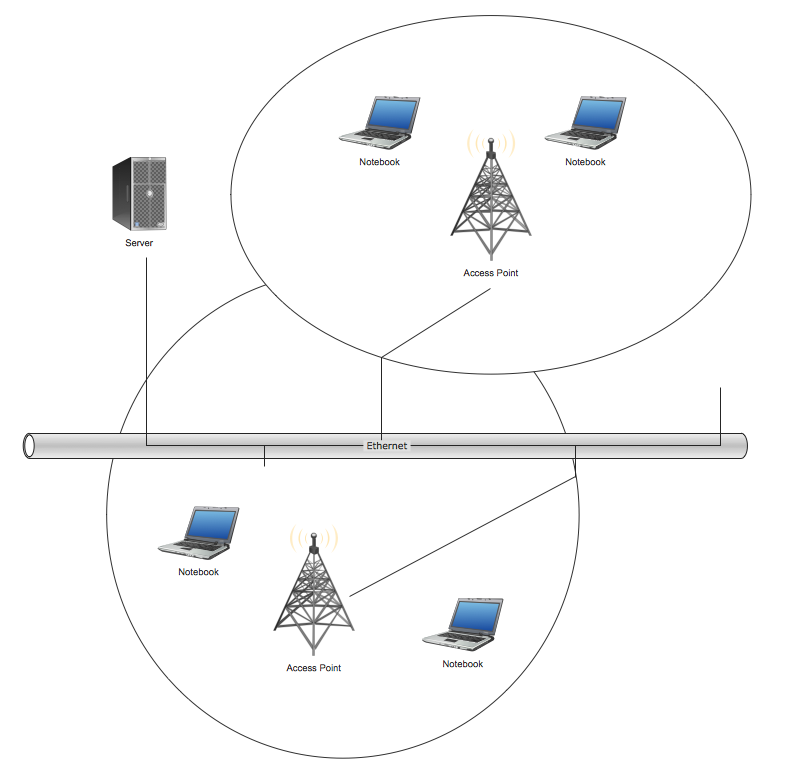 The infrastructure wireless network topology is a hub and spoke topology. It is also named “one to many” topology. There is a single central wireless access point (WAP) in the infrastructure wireless network topology. The ad hoc wireless network topology is a “many to many” topology. There is no central access point, every computer of the network communicates directly with other computer in the ad hoc wireless network topology. Using the predesigned objects, templates and samples of the Computer and Networks Solution for ConceptDraw DIAGRAM you can create your own professional Computer Network Diagrams quick and easy. This sample was created in ConceptDraw DIAGRAM v12 diagramming and vector drawing software using the Computer and Networks solution from Computer and Networks area of ConceptDraw Solution Park. This sample shows the Point-to-point network topology. Network topology is the topological structure of the computer network. Point-to-point network topology is a simple topology that displays the network of exactly two hosts (computers, servers, switches or routers) connected with a cable. Point-to-point topology is widely used in the computer networking and computer architecture.